Quick update. We just launched two requested features that we hope you may find useful. Your donors now have the option designation their donation to fund a specific department or mission in your organization. In the optional field section of the campaign editor check “Ask for donation designation”. Afterwards, fill out a list of departments that your donors can choose to designate to. 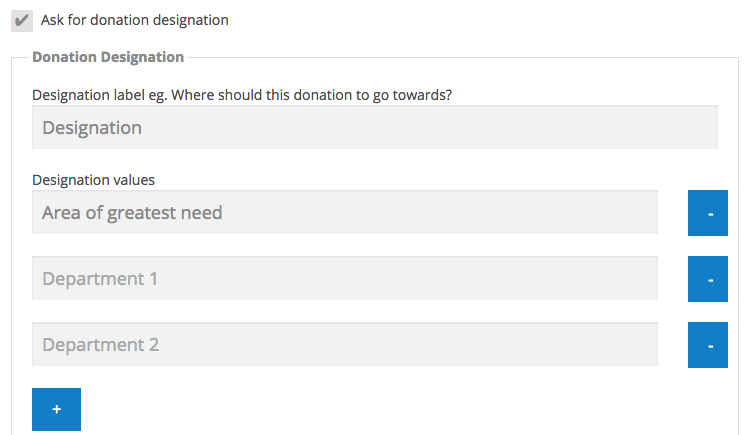 This will result in a designation dropdown list on your donation form. It’s great to see many great causes from around the world using Donorbox. By default, donation forms will load in the language that the donor’s browser is in. We noticed some of you are creating forms with suggested amounts that are written for a specific language speakers. Thus, we thought it would be beneficial to be able to hard-set the language the donation form should load in. This feature is also in the campaign editor. Currently, we support Español Français Deutsch Svenska Italiano and…English. If you have another language that you would like us to support please let us know.